How do we learn new ideas? One of the most powerful methods is to relate the new concept to an existing idea that we already understand. Imagine living in pioneer times and wanting to connect Vancouver and Edmonton, after a road has been built to Calgary. One option would be to strike out further north and build a completely new road directly to Edmonton. But this would be hugely expensive – so expensive that it might never get done. 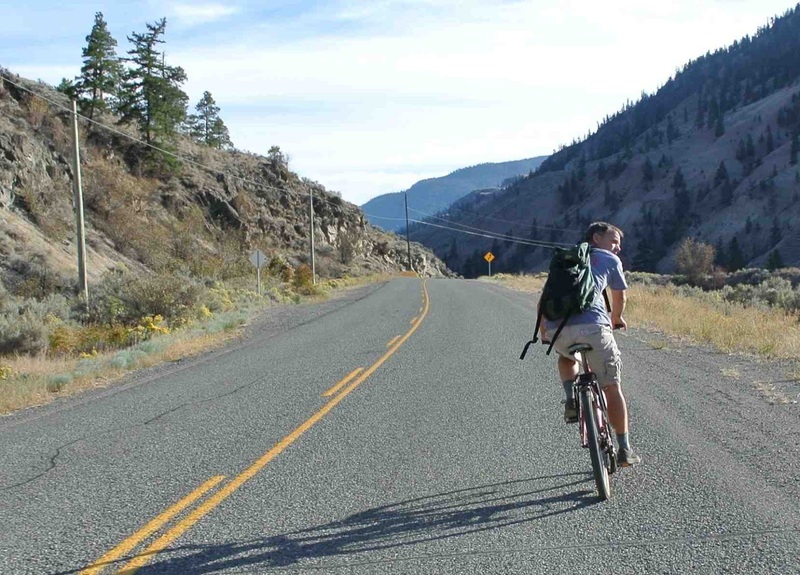 The alternative would be to use the existing road to Calgary, and then build a spur highway from Calgary to Edmonton. Most of the road already exists already, so this option would be vastly easier. The brain is essentially a road map of connections from one node to another. If we want to learn an entirely new concept – let’s say “the face of Sarah Palin” – we could try to create an all-new series of connections to build the ideas of “Sarah Palin’s nose,” “Sarah Palin’s glasses,” “Sarah Palin’s eyes” and so on. Or we could use information we already have – perhaps “Tina Fey’s face” – and then build little spurs away from that concept to fit Palin “except different glasses,” “except bigger hair,” “except less sense of irony” and so on. By doing this we treat Tina Fey as a metaphor for Sarah Palin. At a neural level, this is probably exactly what is happening. We will use many of the same connections for both faces, for the sake of efficiency. So metaphors may be more than just a literary trick you learned in English class: they are an external manifestation of the structure of the brain. Or not. Regardless, metaphor is a great way to get an idea across quickly. In a recent discussion on an online forum in which I participate, someone suggested that we all share the metaphors we often use in therapy. Good idea. And it may become a recurrent “bit” I use in this blog. We’ll see. Here’s one of mine. It's a two-parter and comes across like a joke, and leaves it up to the listener to contemplate how to connect the dots, but it often sparks useful discussion in therapy. It can be translated for “Three Women …” but in practice I’ve mostly found it useful with men. 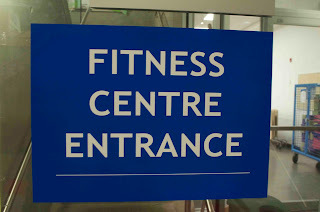 Three guys walk into a gym and decide to use the chin-up machine. This is a device with elevated handles so you can practice chin-ups, but with a platform to stand on that can give a variable boost. The first guy doesn’t turn the machine on. He just reaches up, grips the handles, and does 20 chin-ups, his feet leaving the platform. The second guy tries the same thing, but doesn’t get off the ground. He turns the machine on, sets it to give him 50 pounds of lift, then reaches up and does 20 chin-ups. The third guy takes over, leaves the machine on 50 pounds, and doesn’t get to the bar. So he turns the machine up to a 100 pound boost and does 20 chin-ups. So: Which guy is the strongest? Three guys walk into an interview, and are asked what it would take to make them happy with their lives. The first guy says that before he could feel contented he would need to succeed in business, become the president of his company, live in a mansion, earn a seven-figure salary, have a loving and supportive family, and be admired by thousands. Then he could be happy. The second guy says that before he could feel contented he would need to have a good job, earn a six-figure income, live in his own house in a nice area, and have a few good friends. Then he could be happy. 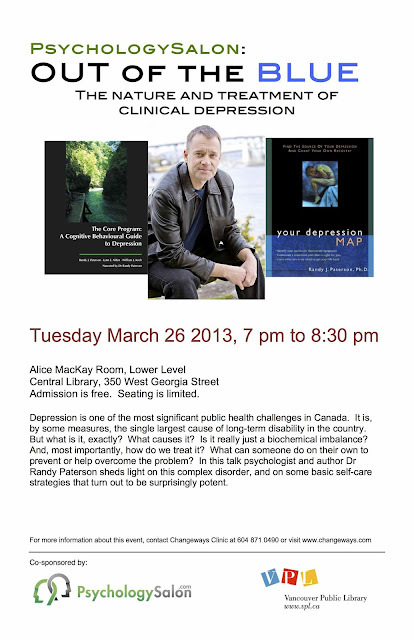 On Tuesday March 26 at 7 pm we kick off our four-talk 2013 series of Psychology Salon presentations for the public. 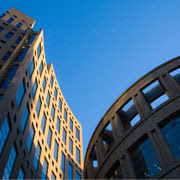 Our series is at the Vancouver Public Library, Central Branch. It's held in the Alice MacKay Room beneath the concourse. The first talk in the series is Out of the Blue: The Nature and Treatment of Major Depression. Think you don’t know anyone with depression? You are almost certainly wrong. Forget bird flu. Clinical depression is the real epidemic in Canadian society. Within 5 years it will be the leading cause of long-term disability claims (several indications suggest that it already is). A recent study indicates that 20% of BC women have been prescribed antidepressants. But what is depression, exactly? Is it overdiagnosed? How is it treated, and are these treatments effective? The signs and symptoms of depression. How clinicians distinguish true depression from the everyday blues. Problems with a medication-only approach. 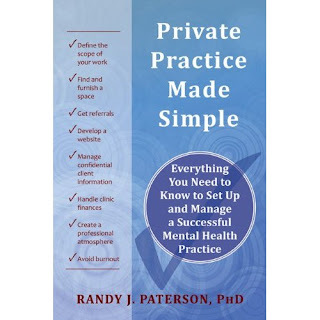 Self-directed coping strategies, including free resources available from the web. We’ll try to cut through the myths about depression and see the reality. Like all PsychologySalon talks, this presentation is for everyone: those with depression, those treating it, policy makers, business leaders, and the general public. Whether you have clinical depression or not, depression touches your life. Many thanks to the Vancouver Public Library for cosponsoring the Psychology Salon series in 2013! All talks start at 7 pm and are held in the Alice MacKay Room of the Main Downtown Branch of the Library (below concourse level). Tuesday May 28 - Superhero Psychology 101: Understanding the Appeal. With Dr Lindsey Thomas. Our culture seems obsessed with superheroes - certainly in the movies and popular culture. What needs are served by these characters in fiction? Is it a longing for lost gods, an externalization of our narcissistic desire for power, a reaction against the drabness of modern life, or just a desire to see special effects on screen? Tuesday September 24 - The Vision Project: Setting - and Reaching - Your Life Goals. With Dr Randy Paterson. What do you want, really? What would you be doing if you took your life seriously? Life is like a sailing trip. You want to enjoy the ride, but every now and then you have to look at the map and put your hand on the tiller. This PsychologySalon evening covers the strategy, the concepts, and the traps along the way. Tuesday November 26 - How to be Miserable: 12 Brilliantly Effective Strategies. With Dr Randy Paterson. What if we stopped trying to feel happier, and instead tried to feel WORSE? We might discover that we are already experts at this dubious skill. This presentation uncovers widely-held cultural beliefs, values, and habits that promote misery. With tongue only partly in cheek, we'll point out the signposts to despair (which, if disobeyed, might lead to a sunnier destination). Mark your calendar! Hope you can make it. 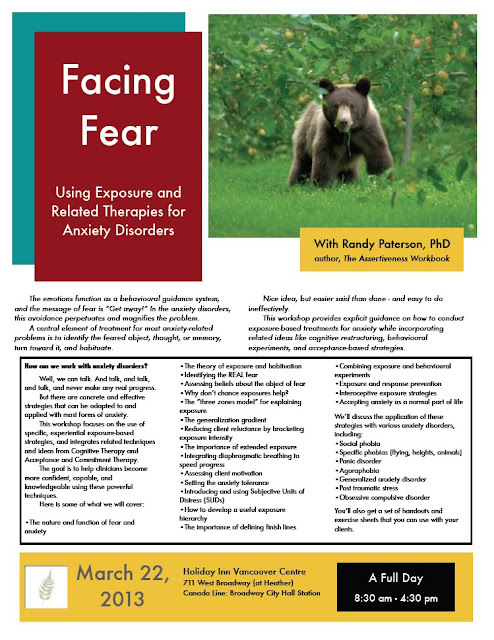 A quick reminder about my upcoming workshop "Facing Fear: Using Exposure and Related Therapies for Anxiety Disorders." This program is taking place next Friday, March 22 at the Holiday Inn Vancouver Centre. The program runs from 8:30-4:30. Registration is limited to 40 people, and we have a few slots left. The program is intended for professional therapists who have an interest in the treatment of anxiety. For further details, to get the flyer, and to register, visit the Changeways Clinic website presentation calendar here. I'd be here more often. Several years ago there was a fad among some religious folk to ask WWJD, or “What Would Jesus Do,” when faced with a decision about their own behaviour. Though much parodied ("What Would Yoda / Obama / HomerSimpson / XenaWarrierPrincess / DonDraper Do? "), it probably wasn’t a terrible idea. The problem with living by temptation (or, more precisely, by anticipatory desire) is that most of us are unfortunately wired to want things that don’t turn out to be satisfying, fulfilling, or useful. If we act on our impulses we will switch on the TV, pour another drink, skip work, play computer solitaire, avoid completing our taxes – and then complain that we’re bored and that we’ve wasted another evening. Impulse is a poor guide. By asking “What would X do?” we use a nice and sharp conceptual knife to separate our impulses from other considerations. The trick, of course, is to know whom to use for “X.” Mad Men’s Don Draper is probably a bad choice. Jesus/Buddha/Ganesh may put things a bit out of reach. Cynics will point out the obvious concern. “If I was living the life I envision I would be waking up at 11am, walking across my gold-tile floors, and being served a 6-course breakfast while having my feet massaged.” Obviously this is not the “I” we’re talking about. But no one seems to go there. An interesting aspect of the question is that we don’t have to sit and think very hard about the answers. When we ask it, we tend to know immediately what we would be doing. I’d be exercising, not sitting on the couch eating chips. I’d be working on my project, not reading Google News for the 8th time today. I’d be visiting my sick friend, not making up excuses for myself about being too busy. The ease with which we answer the question “What Would I Do?” reveals that we have fairly constant access to guidance from within. We don’t have to capitulate to “What do other people expect of me?” or “What would a conformist do?” or “What would a dull and lifeless responsible adult do?” We can live our own lives, take our own guidance, and make the most of the time we have to embody the values we hold. Want more strategies like this one? Our clinic has developed a cognitive behavioral guide to self-care for depression. Though not a substitute for professional face-to-face care, UnDoing Depression may be a useful adjunct to your efforts. The preview is below. For 50% off the regular fee of $140 USD, use coupon code “changeways70” when you visit our host site, here. When you work for a large organization, the way that client files are managed is already determined for you. 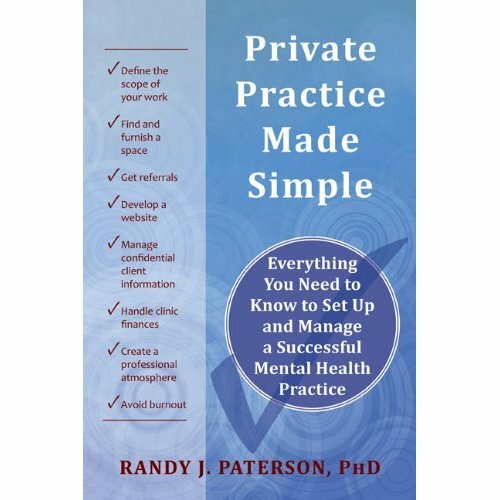 When you open a private practice, it’s up to you. What kind of system should you use? One option, of course, is the client’s name. How about just calling Abraham Lincoln's file “Abraham Lincoln” and leaving it at that? Not bad, and indeed “Abraham L" or “Abraham Lincoln” will probably appear on the file header. But in the course of seeing any client, you will gather all kinds of information about them and you will want to maintain strict security and confidentiality. For example, Abraham will pay you sooner or later and you’ll need to record the payment. But your accountant shouldn’t see that Abraham is one of your clients. You’ll probably have computer files for different things, like a blank for Abraham’s payment receipts, or goal lists, or session notes, or letters to his physician. And you don’t want his name on all those files, even though you will practice excellent data security using encryption and so on (more about that another time). As well, you’ll want to track some elements of your practice. You’ll want a simple way to know how many different clients you saw last year compared to the year before, or how many referrals you get each month. For these reasons and more, it’s helpful to assign each client a number, and then use the number for the file and any computer information you hold. There are lots of systems for this, but I settled on one for Changeways Clinic years ago and we’ve found it simple, useful, and easy for everyone to understand. 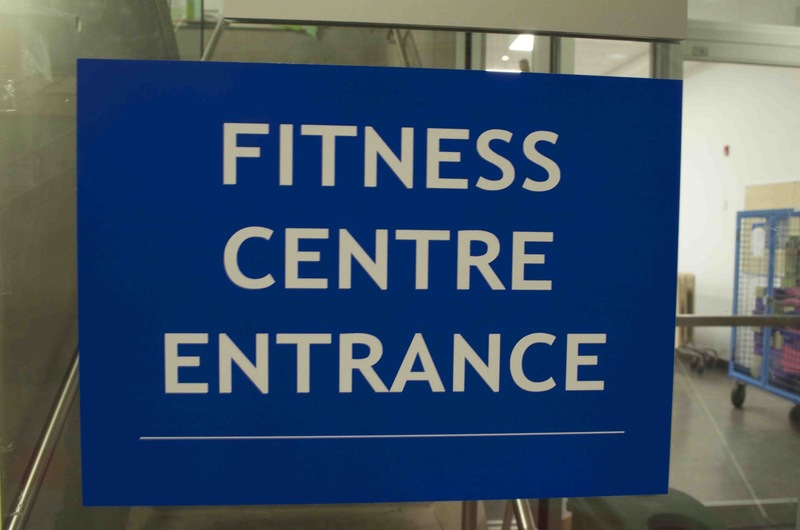 Our client numbers begin with the year that the client was first booked into an appointment at the clinic. Then we have a dash, then a 3-digit number assigned in sequence as new clients are seen. Then the client’s initials. So the first client booked in 2013, let’s say Marie Curie, would be 2013-001MC. 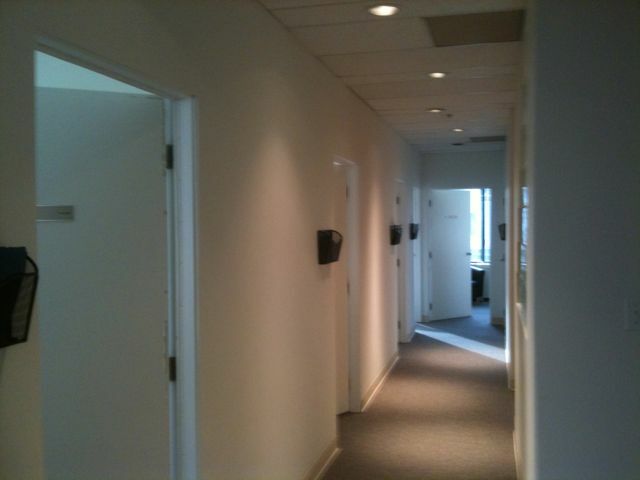 Except that when I started out, I only saw a few private clients. Client numbers are mostly in the background; clients don’t usually see them. But if they did I wondered if someone would say “Hey, I started seeing you in February and my number is 1999-001. Am I your only client?” So I started each year with 101 instead of 001. To this day, our first client of the year is 101. This enables us to record client payments with a number that we can easily match up with a client’s file, but that doesn’t tell the accountant the names of people we see. It also allows us to have computer files labeled 2013-101MC that don’t reveal anyone’s identity. Different types of files have different endings. So 2013-101MCbill.doc is for receipts, 2013-101MCgoals.doc is for the goals the client set in session, 2013-101MClet.doc is for any notes that Marie has requested I send to her physician, and so on. Again, all files are also encrypted. Marie would keep the same number no matter how many years she sees us. Blank client files are made up months ahead. We include intake forms and other documents that we use with almost everyone we see, and the file is prelabeled with the numbers in sequence. When a new referral calls to book, we just take the next blank file in the drawer and add the person’s first name and last initial. The file numbers are in a Word document formatted for Avery labels and printed out as we create more blank files. Each year the clinic assistant simply opens the file and does a find/replace/ALL, changing 2012-101 to 2013-101, then printing sheets of new numbers for the coming year. This system makes tracking the number of referrals quite easy. At the end of the year you can simply look at the number of the last client booked. If it was 2013-400, then you know (given that you started with 101) that you had 300 new bookings that year. Also, your assistant can glance at the blank files on the first day of each month. If last month the next one in line was 2013-301 and this month it’s 2013-353, then you know you had 52 referrals last month. Keeping a record of these over time can show month-to-month referral trends. If the numbers for the past 4 months were 52, 47, 31, 28, then it’s time to focus on clinic promotion. You can also look at (or graph) monthly referrals year by year, revealing that August is always slow for you, or that fall is when you are popular. It's useful to decide on a system early in your practice and keep to it. Although it may save you only a second or two each time you deal with a file, over time the benefits can add up. Just think of it as a kind of behavioural compound interest.